This international workshop will focus on the rise of caste and religious divisions and possible languages of secularity in contemporary India. It will explore the persistence of pre-modern identities and cleavages in contemporary Indian politics such as caste and community with special emphasis on Dalit assertion, and their consequences for the Lok Sabha general election which is taking place in April–May 2019. Please register at jiri.krejcik@soc.cas.cz by 25 April 2019. The workshop is organized by the Institute of Sociology of the Czech Academy of Sciences, Centre of Global Studies at the Institute of Philosophy of the Czech Academy of Sciences, and Institut für die Wissenschaften in Vienna within the Research Programme “Global Conflicts and Local Interactions”, Strategy AV21. The lecture The largest antipoverty social program in the world: Effects of a conditional cash transfer program on its participants in Brazil will focus on the main ideas of Prof. Alessandro Pinzani’s new book “Money, Autonomy and Citizenship” (Springer 2018) which he wrote together with a Brazilian sociologist Prof. Walquiria Leao Rego. The book analyzes the impacts of the largest antipoverty social program in the world on peoples’ lives: the Brazilian Bolsa Família Program. Created by the government of former Brazilian president Luiz Inácio Lula da Silva, this program of civic inclusion has been the largest conditional cash transfer program in the world during that time period, serving more than 50 million Brazilians who had a monthly per capita income of less than USD 50. 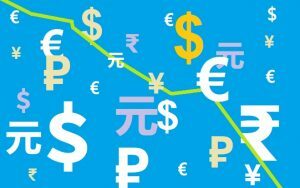 The program is regarded as one of the key factors behind the significant poverty reduction in Brazil experienced during the first decade of the 21st century. Alessandro Pinzani is Professor at the Federal University of Santa Catarina in Brazil (since 2004). This semester, he is a Guest Professor at the Centre of Global Studies in Prague. He earned his Ph.D. at the Universität Tübingen in Germany. He was Visiting Scholar at Columbia University in New York, at the Humboldt-Universität in Berlin, at the PUC-RS in Porto Alegre in Brazil, and at the Ruhr-University of Bochum, for example. He focuses on autonomy of individuals, poverty and social programs in Brazil and Latin America. Seminar will be held in English. No registration is needed. Books will be presented by Martin Kopecký, Marek Hrubec and Vlastimil Hála. 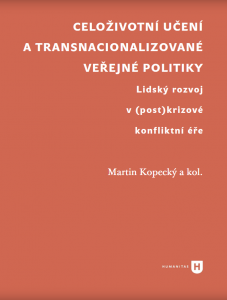 Martin Kopecký et al., Lifelong Learning and Transnational Public Policies. Human Development in (Post)Crisis Era. Prague: Faculty of Arts of the Charles University, 2018. Interdisciplinary book addresses all readers interested in the position and transformation of education, especially education of adults, during the last phase of the globalization process, which is distinctive for encounter with different types of crises. 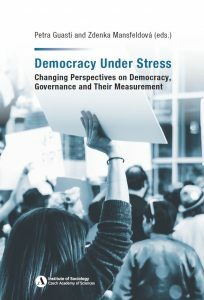 The book is an outcome of the research activity Moral Responsibility: Human Development and Public Conflicts. 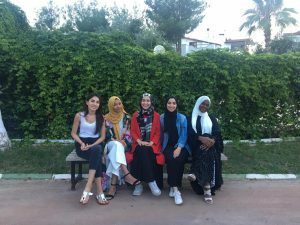 The conference will focus on the complexity of Muslim feminist approaches to Islam, on discourses about gender equality in the Qur´an and on various expressions of Muslim women fighting for emancipation from patriarchy to show that Muslim women have both the power and agency to change patriarchal settings in their societies and organizations. Please register at mekhrangez.rakhmonov@std.antalya.edu.tr by 21 November 2018. 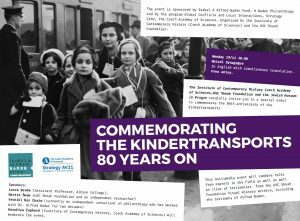 The Institute of Contemporary History Czech Academy of Sciences,USC Shoah Foundation and the Jewish Museum in Prague cordially invite you to a special event to commemorate the 80th anniversary of the Kindertransports. This multimedia event will combine talks from experts in the field as well as well as clips of testimonies from the USC Shoah Foundation Visual History Archive, ncluding the testimony of Alfred Bader. The speeches will be in English with simultaneous translation. Free entry. 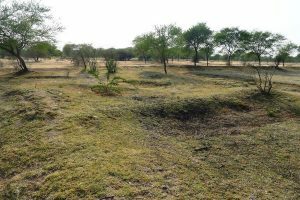 What are the local impacts of the global climate change and how is it perceived? The conference will aim at social aspects of the climate change from the perspective of social sciences. We will discuss the attitudes of the public and various interests groups towards the climate change, a problem which becomes more palpable even in Czechia. The conference will introduce the scientific research of the Czech climate skepticism, roles of the civil society and experts in the adaptation of the Czech landscape, social movements addressing the climate change, and will focus on the global and local linkages – both in Czech and transcultural contexts.